[시사뷰타임즈] 일본 아사히 신문에 따르면, 한국의 전 대통령 박근혜가 북한 지도자 김정은을 암살할 계획을 짜고 있었다고 한다. 이 신문은 월요일, 부정부패라는 추한 짓으로 탄핵을 당한 박근혜가 2015년 ‘북한 지도층 교체’ 서류에 서명했다는 것을 이름을 밝히지 않은 소식통의 말을 인용하여 보도했는데, 한국 정보부 요원들이 이 계획을 실행할 준비를 하려했었다는 것이다. 이 신문 보도에 의하면 음모를 꾸미던 사람들은, 김정은이 타고 있는 차량이나 기차를 사고가 나게하거나 탈선시키는 등의 방법론이 상정돼있는 가운데, 일을 어떻게 실천에 옮길지 숙고 중이었다고 한다. 박근혜 행정부도 북한에 쿠데타를 일으킬 것을 고려하고 있었던 것으로 알려졌다. 한국의 공산주의 이웃인 븍한의 군사적 활동은, 즉 핵무기 배발 프로그램 등이 이러한 암살 음모에 동기를 제공했던 것이라고 아사히 신문은 말했다. 서울과 평양 간의 긴장은 2015년8월, 북한이 국경 도시인 연천 시를 향해 발포하자 서로 총격을 주고받으면서 고조됐었다. 하지만, 북한 지도자 김정은을 암살한다는 계획은 박근혜가 탄핵당한 뒤 문재인 행정부에선 채택되지 않았다고 이 신문은 보도하고 있다. AFP통신은 지난 5월, 북한 보위부의 말을 인용, 북한은 미국과 한국이 김정은을 모종의 화학물질로 살해하겠다는 음모를 꾸미고 있다고 비난했다고 보도했다. 북한의 에이시어(아시아) 이웃 국가들은 오랫 동안 북한의 핵 및 미사일 실험에 대해 진지하게 우려해왔다. 북한은 2016년이 시작되면서부터 유엔의 제재안을 위반한 채 2차례 핵실험을 비롯 수십 차례의 미사일 발사 실험을 해왔다. 북한은, 일본, 한국 그리고 미국 함대가 한반도 주위에서 해상 훈련을 할 때면 이러한 실험들을 하겠노라고 계속 위협하고 있다. 언론들은 미국 관계자들의 말을 인용, 6월22일 북한이 미국 본토에 닿을 수 있는 대륙간탄도미사일(ICBM)에 장착할 수 있는 우주라켓엔지 실험을 한 것으로 알려졌다고 보도했다. 지난 4월 미국은 북한의 위협으로부터 한국을 보호한다며 사드(THAAD; 높은고도최종단계처리) 미사일 체제를 한국에 배치했다. 미국의 사드배치는 한국내 시위를 촉발시켰는데, 일부 시민들은 사드가 북한이 공격할 빌미만 제공할 뿐이라고 본다. 그러나 사드에 대해 회의적인 새로 선출된 대통령이 환경에 미치는 영향을 조사해야 한다고 요구하면서 사드 체제 배치가 지연됐는데, 이 조사는 길면 1년이 걸릴 수도 있다. Former South Korean President Park Geun-hye was making plans to assassinate North Korean leader Kim Jong-un, according to Japan’s Asahi Shimbun national newspaper. Ex-president Park, who was impeached due to a corruption scandal, signed a document approving a “leadership change” in North Korea back in 2015, the national daily reported on Monday citing unnamed sources. South Korea’s intelligence agencies were to prepare operations to carry out the plan. The report notes that the plotters considered arranging accidents, with a car accident or the derailment of a train carrying Kim Jong-un on the table. Park’s administration also reportedly considered staging a coup in North Korea. The military activities of South Korea’s communist neighbor, including its nuclear arms development programs, apparently motivated the alleged plot, Asahi Shimbun notes. Tension between Seoul and Pyongyang spiked in August of 2015 as the countries exchanged fire after the North fired a projectile at the border city of Yeoncheon. However, the plans to assassinate the North Korean leader were not picked up by President Moon Jae-in’s administration after Park’s impeachment, the daily reports. 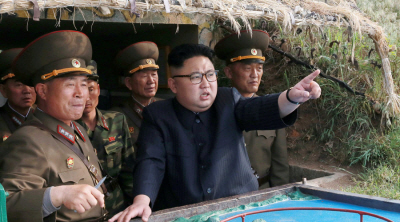 In May, North Korea accused US and South Korean spy agencies of plotting to kill Kim Jong-un with some “biochemical substances,” the country’s Ministry of State Security said, as quoted by AFP. North Korea’s Asian neighbors have been gravely concerned about its missile and nuclear tests for a long time. Pyongyang has conducted dozens of missile launches and tested two nuclear bombs since the beginning of 2016, in violation of UN resolutions. The North consistently threatens to carry out these tests when Japanese, South Korean and US fleets are conducting naval drills in the region. On June 22, North Korea reportedly tested a space rocket engine that can be installed on an intercontinental ballistic missile (ICBM) potentially capable of reaching the US mainland, according to American officials cited by media outlets. In April, the US deployed its Terminal High Altitude Area Defense (THAAD) anti-missile system in South Korea to protect the country from its northern neighbor. The deployment triggered protests in South Korea, as some citizens see THAAD as giving the North Korea reason to strike. The deployment of the system has been delayed, however, as the newly elected president, who is also a THAAD sceptic, has demanded that an environmental impact probe be conducted, which could take up to a year.